Pole position and two podiums for Bradley Ray. Podium and Superstock 1000 championship lead for Billy McConnell. Buildbase Suzuki’s Bradley Ray and Billy McConnell took three podium finishes between them at Cadwell Park, at round eight of the Bennetts British Superbike Championship. Ray claimed pole position in qualifying for today’s two races, and led for much of them on his GSX-R1000, but narrowly missed out on the wins, finishing second twice. However, he secured a strong haul of championship points and podium credits with one round to go to decide the Showdown top six. Billy McConnell finished second in the day’s National Superstock 1000 race, regaining the championship lead in the process. He led until the final stages, but a mistake into Charlies One saw him surrender his advantage, but it was enough for him to leave with a five-point series lead. 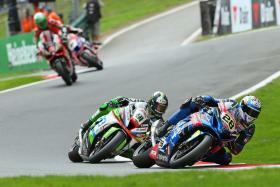 On the second Buildbase Suzuki GSX-R1000 superbike, Richard Cooper finished 11th and ninth after two tight races. Superbike race one result: 1. Leon Haslam, 2. Bradley Ray, 3. Jake Dixon, 11. Richard Cooper. Superbike race two result: 1. Leon Haslam, 2. Bradley Ray, 3. Jake Dixon, 9. Richard Cooper. Superstock race result: 1. Lee Jackson, 2. Billy McConnell, 3. Josh Elliot.